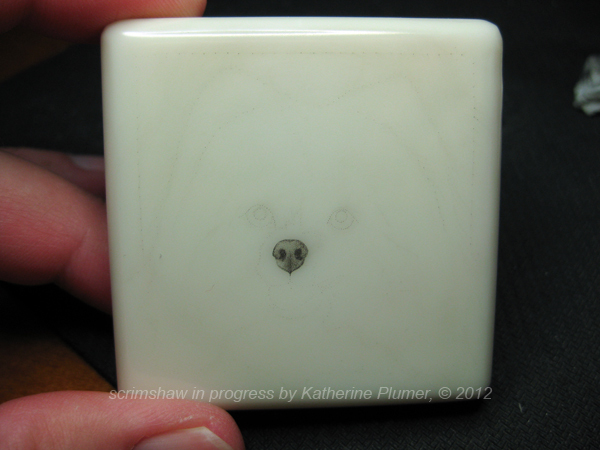 I've just started a scrimshaw piece, I'll just let you watch and see what develops, without saying too much about it yet. The material (because I know someone will ask) is Corian. This is a custom piece. And I need to get it done before the time comes to pack up the studio. Oh yeah and I'm going to Blade Show again in June! ps- Jan, the new blogger settings have me all messed up too, took me a while to find stuff, and to remember to title my posts! Katherine, I sure understand about the necessity for routine when you have an orderly mind. They used to switch our desks around at work way too often, and it would take me a week to get my brain straightened out. One time they simply turned the desk around and I was disoriented. It's so hard when you're personally conservative and socially radical.